New Behind the ARt Video! August Main kit with Junelle! Happy monday FRIENDS!! first off.. THANK YOU so much for the HUGE support of the online workshops class sale! I was in awe of so many of you that took advantage of the sale (We extended it until end of day today.. btw). It makes me so happy and grateful that so many of you are so willing to get come get messy with me.. and to take that Leap into finding your inner artist and truly believing you ARE an artist! Seriously thank you!! CAN NOT WAIT to see what you do with your classes! She seriously is just one creative bug.. simply rocks.. not much more to say except that WEDNESDAY I will be debuting the new fall workshops!! Wahoo! can't wait! So here we go! Junelle's awesome stuff! She just got back from a trip to New York city and was inspired by everything she saw there.. so her art journal page is based on that!! so fun! day in the park from Junelle Jacobsen on Vimeo. UPDATE!!! Many of you have asked about the workshops and HOW LONG you will have access to them.. you will have an ENTIRE YEAR to access each workshop (despite what it may say IN the workshop or anywhere else.. you have a year! hope this info helps! so today i was going to post about THREE Of the new workshops I have going for fall.. My Halloween/Fall workshop, my Christmas/Winter workshop and Junelle Jacobson's newest workshop! (ANd by the way when I do announce them next week we will offer a special if you sign up for more than one!) However.. I wanted to be able to give you TRUE sneak peeks of some of the things we will do and since I hadn't done much for my christmas/winter workshop.. and Junelle is still working a little bit on hers.. we decided to wait one more week to debut them so you can see a lot of fun peek of what will be in store! SO today through Friday.. 3 days!! 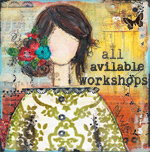 ALl of my past workshops that are currently open.. (which excludes only my newest workshop Artsy Bangles.. which started monday.. and My Living Canvas Workshop.. which is currently closed and will re-open for registration in September)..
ALL of them will be on sale! So my 3 week courses which are normally $44.95..
are on sale for only $24.95!!! That is OVER 40% off!! are on sale for only $9.95!!!! that is 50% off!! Okay so here is the deal.. you HAVE TO USE THIS LINK that will take you to a special page where you can purchase these classes for the sale. If you click to the right of my blog on workshops.. it will take you to where you can READ about each workshop and what it is about.. but in order to get the SALE price you have to USE THIS LINK..
Hope this helps some of you that have emailed me wanting to take workshops.. but being on a tight budget.. to be able to take a few! Basically you are pretty much being able to take two for the price of one! Pretty awesome!! now i am off to go sketch and get all inspired for christmas and winter and all things artsy!! my kids are back in school? They started last thursday.. and it's been a long time since I had a quiet monday! All to myself! Getting so much done.. it's crazy! My NEWEST online class starts tomorrow!! our Artsy Bangles class! COME JOIN ME if you haven't signed up yet! HERE is the info! Today I wanted to post the newest Behind the Art Video.. using the August 2012 Mixed Media kit!! while you can no longer sign up for an august subscription (as subs are closed for august) you can purchase this kit in our mixed media store HERE.. and if you want, email me and we can get you on the list to start a sub for September! email melanie at customerservice@scarletlime.com to get on the sub list for September. okay.. so this month I had some fun crazy ideas I wanted to do.. really whimsical and different.. I had hearts on the brain.. but didn't want something that everyone always sees.. so this is what I came up with..
and NO the canvas isn't upside down.. they are bleeding "heart" flowers.. something kinda fun and different! They were taken from an idea I had recently in one of my art journals..
as you an see on my canvas version I added leaves to the stems.. not sure I like that or not.. but it works :) I also added butterflies to the canvas version. so kind whimsical and fun.. perfect end for summer right? used a lot of texture on this canvas with paints and tissue paper.. so I hope you enjoy it! See you back here wednesday when i talk about the new fall classes!! wahoo! An update on the Artsy Bangles Class!!! This class is ALMOST here! It starts tuesday.. FIVE SHORT DAYS!! and we have so many of you wonderful ladies joining us! Allie and I are both so excited about this course.. we thought we would share with you some more sneak peeks of what is in store! AND there is an update on class kits as well! We sold out of the Kit that goes along with the class.. but we are trying to order another set for those who missed out. We will send out an email when we have them back in stock for all those who are on the wait-list and all those taking the class (you can email me at christy@scarletlime.com to be on the list). HOWEVER You can also just gather the supplies yourself and there is a full supply list emailed to you as well as links to etsy stores and online stores where you can find some of my favorite things that you will find in the workshop itself. AND just as with ALL my other workshops, I always suggest you watch the class first and then decide which bracelets you want to try and make because honestly there are over 20 different styles and maybe there are some that just aren't your style .. so I suggest watching the videos first and THEN buying the supplies according to what techniques and bracelets you want to try! I will also be carrying some of the supplies (outside of the kits) in our beadart store as well. Plus in our bead art store Scarlet lime Bead Art Store.. we have a FULL line of beads, leather bands, metal filigree pieces, stretchy cord and more! So make sure to check out that website too! I am sure most of you don't know we even have that website.. www.scarletlimebeadart.com if you want to check it out! okay so Here is another sneak peek of what we will be making.. lots and lots of different styles! so if you haven't signed up.. there is still time and we would LOVE to have you join us!! you can read about the class and what it entails here! Class starts August 21st and is $19.95! confused yet at what this post is about? lol.. i know.. im a dork. so this last weekend we had are big huge campbell family reunion.. my aunts and uncles, cousins, second cousins.. and even some third.. and it was a BLAST.. i am sad to report I only made it to round two of the Canasta tournament (last year my partner and I won it).. but that's okay. we still had fun! Well sunday night about 3 am in the morning.. my daughter calls us from her cell phone (she's 12 lol) letting us know that she was downstairs and had just thrown up. My husband rolls over to tell me and then he jumps up and runs to the bathroom himself. I was like great. What have we hear. Well by noon yesterday all but two of my kids were sick throwing up, including me and Ben.. AND i texted my brothers and sisters to warn them that we were sick and soon the replies started coming in that they too had sick kids and they were also sick. Then texts saying aunts and uncles were sick and cousins lol.. at first we thought it was food poising.. but a few went to the doctor and no. It is a highly contagious stomach flu. Today we all feel a little better but still dealt with kids throwing up all night long. Today I just feel week.. but not sick anymore. I am just glad this happened before thursday.. as our kids start school thursday! So that is the rain.. now for the rainbow :)..
Last week I mentioned that Junelle had started doing projects using our main kit.. and showed you her project and video for the July kit.. and THIS week we are lucky enough to get to see what she does with the June kit! As you might remember she is doing an art journal page using the main kits (from my Scarlet Lime Store) each month ... here is what she did for june. I love this girl and how she is got her bags packed and ready to go.. awesome. So fun.. thank you Junelle!!! Here is the video! and SPEAKING of Junelle and workshop classes.. my fall line up of classes will be available for signup starting NEXT week.. I have three we are offering...originally I had planned on doing a full holiday workshop.. including halloween, fall , christmas and winter.. but have decided to divide the class up.. and do the halloween and fall workshop in september and make it just a fun five day workshop.. with whimsical halloween and fall mixed media art projects (including two awesome guest artist who will be also doing some cool projects as well).. and then offering a bigger 2 week workshop for the Christmas/Winter one in November.. since it covers so many more subjects..
then of course we have Junelles NEW workshop that starts in October.. and then to end the year we will have another 12 Artsy Ornaments of Christmas again this year! With 12 different teachers, 12 different projects for the holidays! So it will be a super fun fall and winter filled with new classes and new inspiration! can't wait! So watch for then news on all of those next week. I am going to be offering a package deal where if you sign up for all three or even two.. there will be discounts given. anyhow.. okay.. i better head back to bed. Feeling pretty yuck lol.. and need to get better.. my kids need school clothes and school supplies and school starts the day after tomorrow.. so I HAVE to get feeling better so I can go tomorrow! creative little souls.. family time and pinterest.. the perfect match. Hey friends! Happy Wednesday!! Such a beautiful week this week.. really soaking in the fun with the family and enjoying summer like nothing else. My family and HUGE extended family on my dad's side are all coming this weekend for a big Campbell Family reunion! This is my most favorite reunion. My dad had 12 brothers and sisters and most of them had large families as did he and my mom (I have 6 siblings) and so those reunions are just HUGE and so fun. Oddly enough.. though there are hundreds of us.. we are all really close? isn't that so weird? I love it. Family is so important to me. Anyhow... I am a lover of Pinterest as of late.. and saw this idea Elsie from a Beautiful Mess took a mug from the dollar store and transformed it with sharpie markers. Then you are to bake them for 30 mins at 350 degrees (though I saw on another site it was 150 Degrees..) but This the example I saw here.. SO if I would have taken the time to read the post.. instead of just look at the picture, I would have KNOWN that they are not dishwasher safe.. but I didn't.. so here is my experience with it. So i went to the dollar store and grabbed my buckets of sharpies and we went to town. I wanted to make a set of mugs for my new art studio..so when friends come to play and get messy.. they also have something fun and inspirational to drink out of.. so i took my doodling and went to town as well..
We had a TON of fun just being creative, sitting on blankets outside on the lawn.. kids truly had a blast. Then I stuck them in the dishwasher. nope! lol.. it wasn't quite as permanent as I had hoped. While some of the designs still stayed on them, you could see alot some coming off and since then we have washed them a few more times (because we have been using them) and they have continued to come off. So then I decided to go BACK to the post and read a little more.. and she did end up saying she tried handwashing and even scrubbing with a sponge and it held up just fine.. however when she put them in the dishwasher it came right off. SO i learned two things from this.. I know you can probably also use porcelain pens on the mugs as well. DecoArt makes some that are permanent. I am going to try next time as well too. so we will keep you posted! Anyhow.. just wanted to share with you! Next week I want to do THIS fun little project by Chrissie Grace, I saw on pinterest as well.. a few different version..
but just rocks, paints and probably more sharpies (or even Faber Castell pens!) I loved her idea that she put them on her front table and when people came to visit, she would ask them to take one with them. I also love the idea of randomly leaving them on peoples doorsteps.. as a little bit of love. Great project for the kids on both accounts.. creating and sharing. So I will keep you posted on what happens! I have started to pin a ton of project that I "Must create".. so when I do.. whether for family night or just for myself.. I will keep you posted on how it goes! so as most of you know (i feel like I start out 90% of my blog posts that way.. lol).. but as most of you know I have a mixed media kit we do at Scarlet Lime (just posted the video to it the week before last).. and each month I do a video using that kit and post it here on my blog. WELL besides our mixed media kit.. we ALSO have our main kit.. which in the past has been traditionally a scrapbooking kit. We had a wonderful design team who did layouts with that kit each month.. and had a blog that they posted on as well. Well as some of you might have noticed that we no longer have been doing scrapbook layouts or doing the Scarlet Lime blog.. and that has been because we have been slowly transitioning our Scarlet Lime Website to be mainly just mixed media and not scrapbooking related. So while there are some of you that still purchase the main kit for scrapbooking.. I know a huge majority of you purchase it for use with mixed media. So.. I decided to ask my very dear and very talented friend.. Junelle Jacobson if she wouldn't mind doing a mixed media project each month using our MAIN kit.. and she so wonderfully agreed! I don't even have to ask if if you know who Junelles is..
AND she also has done an online class with me called the Art of Wild Abandonment (which is still available to take ANYTIME.. HERE and hands down one of the best class on art journals and sketching every)..
She is SOON going to be doing another class with me again.. In October.. and we will be announcing that in the next coming weeks! But truly she is just one talented girl. So if you get the mixed media kit you know mainly I do project on canvas with that kit.. so I asked her to do some fun stuff with the main kit both in art journals and other things besides canvas. While it officially starts with our August kit.. she is amazing and decided to do videos and projects with our july and june kit too! She simply rocks. so today I am posting the video and project she did using the July Main kit.. Next week the June main kit and the week after will be posting her project with the August kit! Fun and funky and bright for summer! and her is a sneak peek of what she made.. I adore Junelle's whimsical style! So I am excited moving forward to have her do a video project for me (and for YOU) each month using the main kit! Even if you don't get this kit each month.. it's just pure awesome inspiration..